It’s wonderful how one thing can lead to another in historical research. 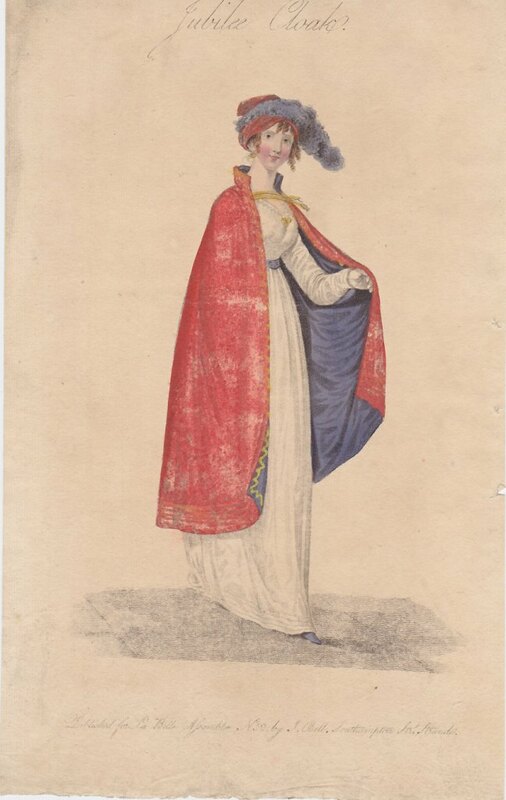 Take this charming print from La Belle Assemblée which I recently added to my collection. The line at top calls it a Jubilee Cloak; it’s certainly a bright, celebratory color, isn’t it? The bottom text reads “Published for La Belle Assemblee #52 by J. Bell, Southampton Str. Strand.” No date was given, so I jumped on-line to see if I could track down when this print was published. I guessed it had to be 1810, because that was the 50th year of George III’s reign, and I hoped that the issue of the magazine in which this print appeared would have further information on his jubilee celebrations, because I had not been able to find any information elsewhere and wanted to write a post on his jubilee for my "what happened in 1810" series...a lack of information which seemed odd. So why wasn’t this listed in an 1810 issue, in which, strictly speaking, it should have appeared since 1810 would have marked his 50th year on the throne? We’ll discuss that—and the Jubilee—next week. A simple Village robe of white corded cambric, a walking length, with long sleeves; ornamented round the bottom with four rows of small tucks; made to sit high in the back, and over the shoulders, meeting in front with a gold broach; trimmed round the neck with vandyked ribband, and confined at the waist by a purple velvet girdle. 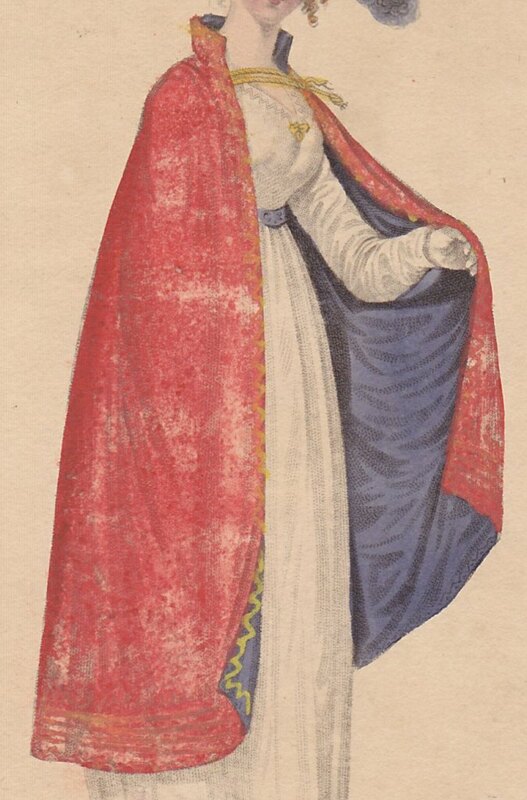 A Jubilee cloak, of aurora colored merino cloth; lined with royal purple silk, ornamented with gold braiding; tied at the throat with gold cord and tassels. A Turban hat, with a full plume of shaded down. Necklace and earrings of gold or coral. Shoes of purple Morocco. Gloves of York tan. “Aurora colored merino”—isn’t that a lovely description? And the royal purple silk lining is most appropriate under the circumstances, don’t you think? This was possibly in the earlier edition because they wanted to showcase special fashions for the jubilee to allow people time to get ready. No last-minute shopping, don't you know. That is beautiful! I'm eager to read about the mystery. Click the link that takes you to the actual scanned book. Wow, QNPoohBear, that is scary. I appreciate the doctor trying to raise awareness, but maybe it would have been better had he not perpetuated the danger. Yikes! Thanks for sharing. Er, yes, I'll take the digital copy, please!